Get more from your greens without shelling out the greenbacks. 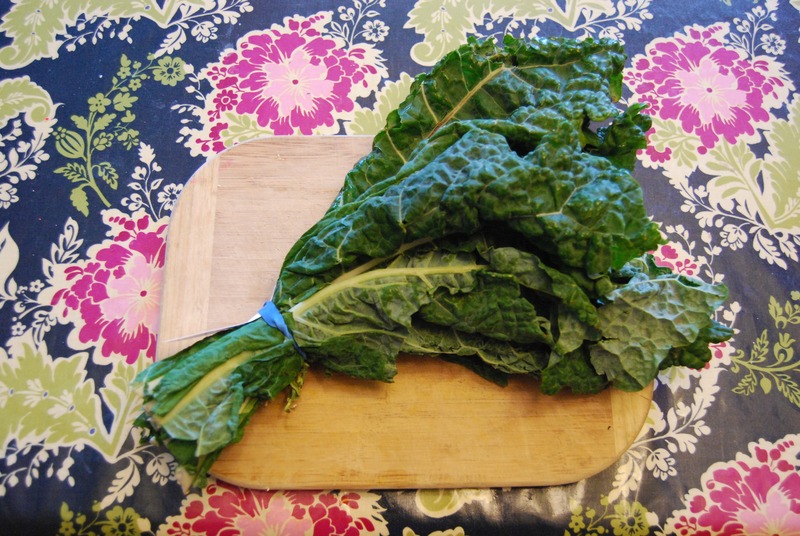 Kale is a wonderful dark, leafy vegetable, found this time of year at bargain prices from your local supermarket and friendly local farmer. All hail the glorious kale! Step aside, you pale and withering icebergs! Make way, you mounds of pompous field greens! Here comes the kale —rich in antioxidants, vitamins and minerals and now, made delicious with a few culinary tricks. All that, and it comes in several varieties, including dinosaur kale. Tell that to your preschooler and see if they’ll shun it now. “Come to the table, kids and eat your dinosaur kale!” My oldest eats in out of the bag, raw. It’s all I can do to get through the market and to the check-out stand before she’s eaten half the bag. This is delightful dish I make on a regular basis, taken from the newspaper and altered only slightly to my tastes. We serve it with brown rice (not white rice; really, white rice was made by the devil, boxed with a picture of a perfectly nice-looking Black man and sold to the unenlightened. I mean it, ditch the white rice and eat the brown stuff. You’ll get used to it, I swear, and then there will be no going back.) and even eat it all mixed together the next day for lunch. Cut the tofu into bite-sized cubes and let it all drain on a paper towel or cloth. Whisk together the soy sauce, lemon juice, honey, sesame oil and pepper. Add the tofu to the mixture and slosh around to get all the pieces nice and marinated. Let it hang out for about 10-15 minutes, or however long it takes you to wash and slice up the kale (in addition to listening to your babbling kids/spouse/neighbor/friend if needed, or trying to catch the baseball/hockey/basketball/soccer score on the radio). Here’s the best way to slice that kale: First find yourself a large knife. Carefully carve out those thick ribs out of the center of each leaf—I slice up one side and down the other with the point of the knife. Then you want to chop it finely—a nice julienne will do, about ¼- ½ inch thick. Put all that into a bowl. It’s good to have a bowl that’s not too wide, because in a few minutes, you’ll need to put something over it—a cutting board or lid. You’ll see why in a couple sentences. Heat up your olive oil in a non-stick skillet (anything other than non-stick for tofu, and you may end up with a scramble and some tears of frustration) on medium-high heat. Now that your tofu’s looking well-coated, gently lift it into the hot pan, without the marinade. Let the tofu sizzle and brown for 2-3 minutes, and then gently turn and rotate them, so each cube gets a turn in the middle (the hottest part of the pan) and gets brown on more than one side. Give ‘em a few more minutes and then carefully add the rest of the soy sauce mixture. Let it bubble and boil for another minute, and then pour it all over your big bowl of kale. Put a cover/lid/cutting board over the top and let the heat of the tofu and the marinade wilt and warm the kale for a couple minutes. Toss the peanuts in and gently mix the salad, so as not to break up your gloriously browned chunks of tofu. This next recipe was taken originally from Martha Stewart’s fine little Living mag, but I altered my photocopied (from the library,of course,) version that I can hardly understand my own corrections. The good news, is that I make it often enough, and enough of it to share—to rave reviews, that I feel that I can call it my own without suffering the wrath of the cooking and entertaining mogul/maven. Notice, however, that there is no link (or link back) to Ms. Stewart and her publication. I may be broke, but I’m not stupid. 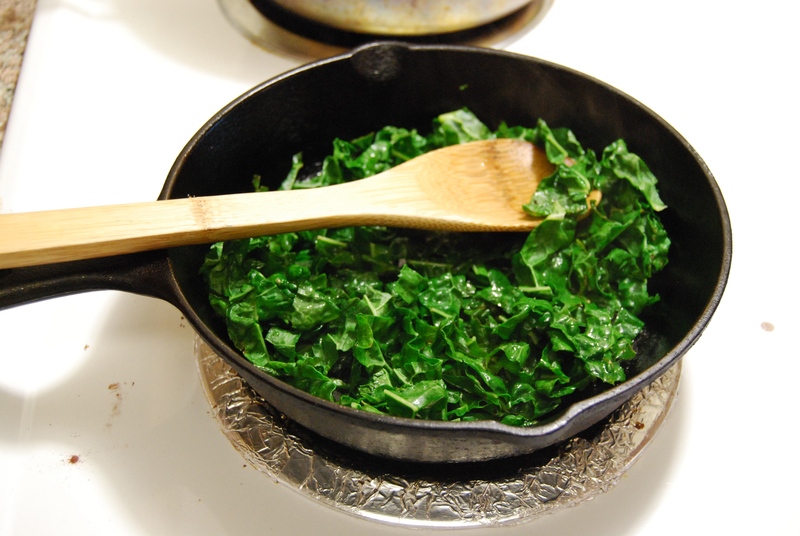 Sautee your kale in a frying pan on medium heat for about 3 minutes, and then add the orange juice, stirring it around until most of the liquid has evaporated. Set it aside and let it cool. Next, heat up your olive oil (the same pan is fine, and cuts down on the dish-washing) and add the onion. Let them cook on medium-high heat until they’re wilt-y and less pungent, then add the garlic and cook for another minute. Add your coriander, cumin, and cinnamon, salt and pepper and bathe all those lovely onions in spice. Lower the heat and add your tomatoes and rice. Stir around about until the mixture is thick and the aroma is delicious—5-7 minutes or so, then toss in the raisins and almonds and take it off the heat. 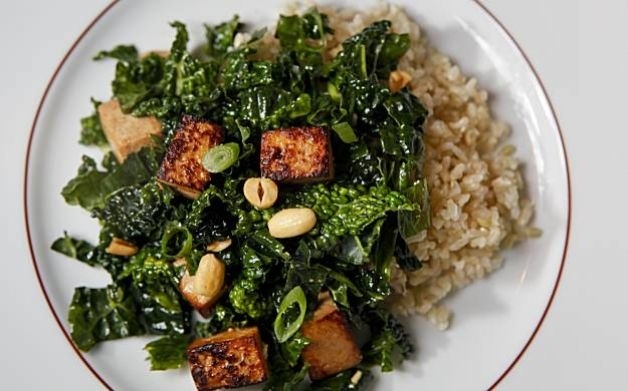 In a large bowl, mix the kale and your rice concoction together. While it’s cooling a bit, take your peppers and chop of their heads (or rather, their tops. You may do impersonations of either the Queen of Hearts or Henry VIII as you do so, but not in front of the pets or the children; you don’t want to frighten them. Unless of course, they get the joke and think it’s funny, too) and pull out the ribs and seeds. 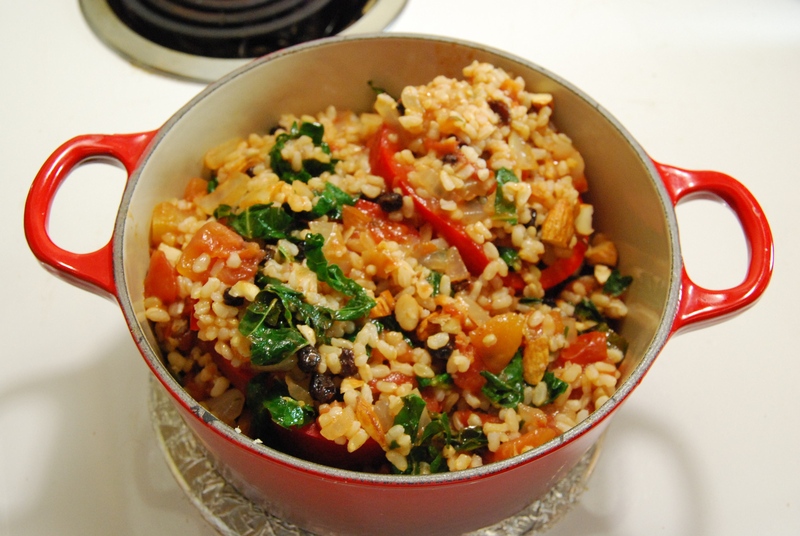 Now you’re ready to stuff those peppers with the rice and kale filling. There will be lots of extra stuffing, so just put that in the bottom of a baking/casserole dish and then place the peppers in on top. Plunk a lid or foil on top of the dish and bake in the over on 350 degrees for about 20 minutes. Hearty and delicious! Note for carnivorous omnivores: A half-pound of cooked ground beef or ground turkey mixed in with the stuffing could be yummy, too. Just go ahead and brown it in the pan after you’ve wilted those onions. Then add the garlic and carry on with the rest of the recipe, including the corny literary and historical impersonations. Over and out. Try it, let me know if you like it… or not. And most important, EAT MORE KALE!